A common question that both employers and employee ask is whether and for how long an unpaid leave of absence should be provided as a reasonable accommodation to an employee's disability or serious medical condition. Generally, a finite leave of absence may be a reasonable accommodation, if it is likely that the employee will be able to perform his duties at the end of the leave. 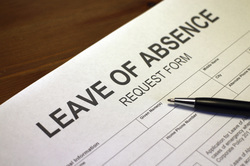 Most courts hold that an employer has no obligation to provide "indefinite" leave of absence, i.e. when it reasonable appears from the employee's medical documents that he is unlikely to ever be able to return to work or perform the job duties of his position (or in some cases - another position, for which he was qualified and applied for as one type of accommodation). An extension of previously granted leave can also be the type of an accommodation that a qualifying employee with a disability may be entitled to. An employer's size and resources may affect its obligation to provide leave of absence as a reasonable accommodation. There is no bright line rule regarding the length of leave of absence or the length of extension of previously provided leave that employers must provide to employees with qualifying disabilities. The larger the employer is, the more similar positions the company has, and the less critical that position is (i.e. admin clerk v ER nurse), the greater the obligation to provide leave of absence is. Thus, a large organization with many resources will have far more extension obligations regarding providing leave of absence to an administrative employee, than a small restaurant with respect to their waiter or a cashier with a disability, without which that business is much harder to run. The California courts' prior rulings make it clear that there is a lot of grey area in the world of leave of absences that serve as an accommodation. Each situation and each employer has to be analyzed individually do determine the respective rights and obligations of both, the employee seeking leave of absence and the subject employer. There is no bright line rule of the minimum or the maximum leave that the employee would be entitled or the employer would be able to provide to accommodate a disabled worker. To make this determination the disabled employee's needs would have to be balanced against the hardship that a (longer) leave would create on the employer's operations.